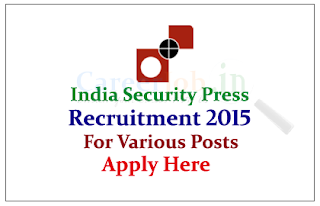 India Security Press is recruiting for post of Supervisor 2015. Interested and Eligible candidate can apply here on or before 15th June 2015. India Security Press is a government press in India where items like passports, visas, postage stamps, post cards, inland letters, envelopes, non-postal adhesives, court fees, fiscal, and hundi stamps are printed. The press is located near Nashik city in Maharashtra state of India. Interested and Eligible candidate can send their typed application with required documents to below mentioned address on or before 15.06.2015, for more information kindly check Official Notifications.